im a bit stupid tho i think my new 32gb card is corrupt. Bought it off ebay for 17 euro, sounded too good to be true... looks like it was, everything else works no problem though so its annoying. ill get a new one and try that..
Hi, sorry for making another topic about this but the actual topic kept logging me out and it was getting very frusterating. Okay, I downloaded this game from Emuparadise and am unsure if it's the game itself or fpscec but it keeps crashing on the part where Cloud and the others are escaping the Shinra building. Right before the cutscene where Cloud mounts the motorcycle. Is there any fix solution for this? By the way, I have the supporter version. In the last update FFVII's targeting was messed up so the cursor doesn't show up next to the enemies but rather creating a small camera image above your player names. That and the Start/Select buttons are now overlapping when the phones held vertically. When its in landscape mode only Start is shown. Running it on a DroidX. Hopefully there'll be a fix soon but also thanks for all the updates that's been put out since launch on android os. This BIOS seems to fix quite a few issues lately. No dice. :/ Still showing that mini camera angle on the character names. first post and all that so be kind! 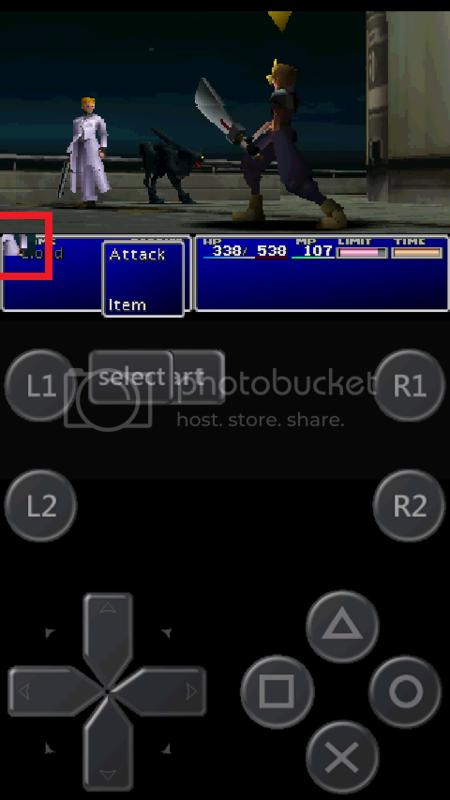 i have FFVII running on my stock HTC Desire (2.2) and generally it's running pretty good. Nice and quick and looking great. But to me the sound was a bit pants. So i tried changing the settings based on a post i read somewhere on this forum. Change frameskip to 40 and enable Spu sync. The sound deffo seemed better on restart. But when i loaded up my saved game i now have NO sound at all. It's most frustrating. if anyone can help me get my sound back i'd be grateful. First of all i know this forum doesn't have anything for the android version but.... there is nowhere for the android version... i really don't know where to look. Well I have been trying to play final fantasy VII on my android phone, currently using version 0.10.17 (latest) and it does not work. it seems to work well except that it doesn't recognize my key presses. i've tried hardware keys mapped, tried on screen touch... it just does nothing. no button. i tried many configurations, tried turning it off and on again... tried two final fantasy vii iso's (ntscu and pal) and nothing! same here, disabling frameskip fixes it.